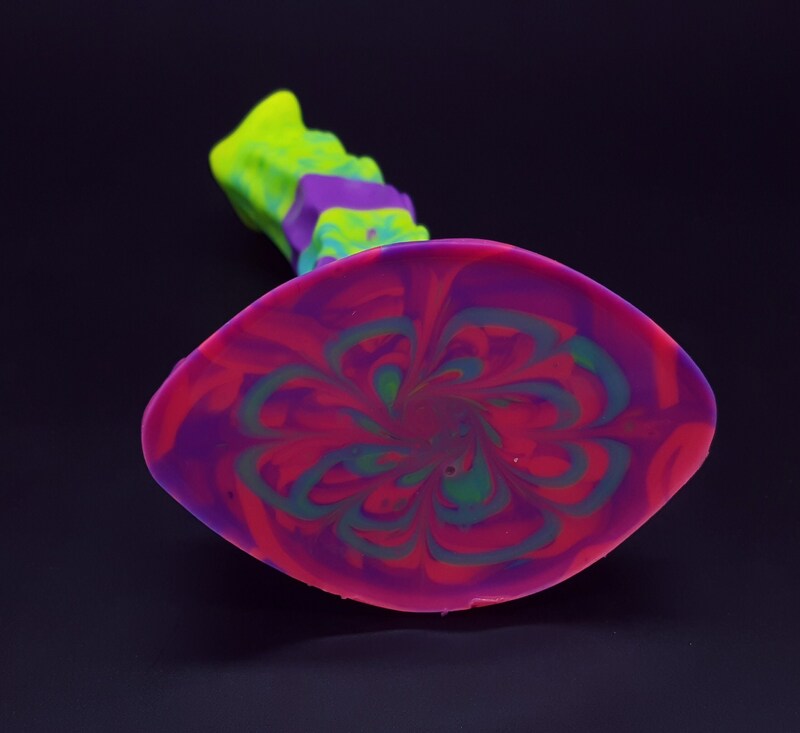 Head Circumference 4.375", Diameter 1.39"
Top Shaft Circumference 4", Diameter 1.27"
Base Shaft Circumference 4.5", Diameter 1.43"
Coloring - Fluorescent Coloration in layered marbling. *Note - This is a one off shop pour of the Xenuphora. It is in inventory and ready to ship. I've received countless requests to "Make a tentacle!" Iv'e made two. Here is the Xenuphora, the smaller cousin to the Xenusoid. Like the Xenusoid, the Xenuphora is also an Alien Tentacle Being. An alien (which I haven't made up yet) world supports life in pools of flowing liquid where the Xenuphora anchors itself onto the smooth surfaces where the current is mild. Its prey is anything that passes by, snatching it up in its sixteen prominent soft suckers, each sucker devouring its prey little by little. The outer skin is armored and when threatened, The Xenuphora will curl up into a ball defending itself from hungry predators looking to feast on its tasty soft belly. Xenuphora prefer to distance themselves from the stronger currents populated by larger creatures, instead nab smaller prey in mild currents. Xenuphora can be seen along smooth, sand sculpted walls of smaller pools, all brightly colored in their own unique patterns meant to attract prey.